When the email came in last week that our local Art Creations store was having a sale up to 40% off on many items, I got very excited! Even if we didn't have much money budgeted for art supplies, I just dreamed of the possibilities deep discounts made possible. 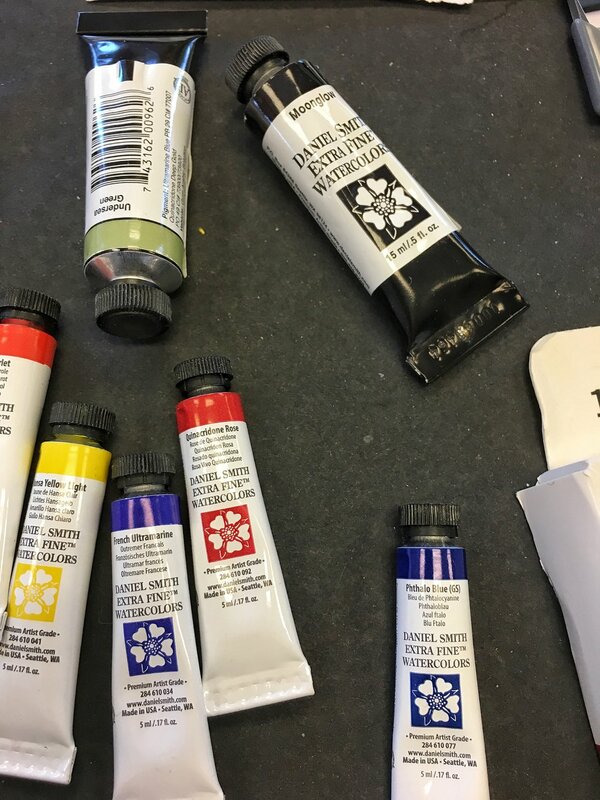 I have been dreaming of improving the artwork for some of our books and have been wanting to get some paints to try out to see if I could create better artwork than the digital designs I've been creating. Recently, we've invested in some Craftsy courses during their sale times as part of our ongoing learning. 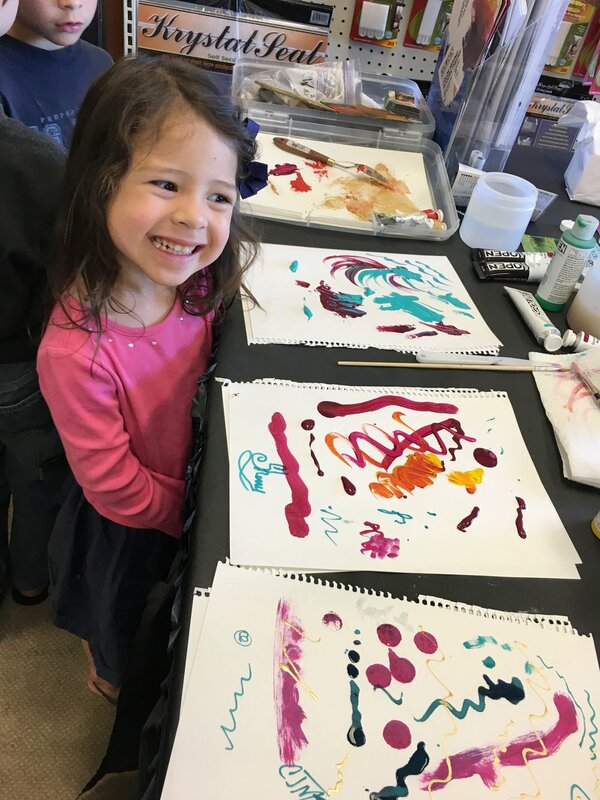 We've incorporated some of these helpful art classes on color study, drawing, and painting for our children’s homeschooling too. I wasn't sure we would be able to go to the store during the sale because I've been fighting a long struggle with my longest on-and-off bout of nursing infections that I've ever experienced in my life. I'm nursing my seventh baby, and, up until, now I've only had a nursing infection reappear at most a second time. Many midwives and lactation experts point to extreme stress among other factors in a mother having nursing issues like mine. Let me just say that our family is looking forward to any type of break or relaxation to recuperate! Surprisingly, I've had my clogged duct issue appear not just three or four or five times but six times in a row! That came after almost a month of struggling with my most painful canker sore issue ever too. I'm so thankful I figured out what was causing and making my canker sores worse and was able to start the healing process and bring great relief within a day of naturally treating it with some particular foods and supplements. So if you've noticed how I haven't had much online activity the past month or so, I've been taking a slight break. It's been bustling with activity and other things here in our home with everything going on in our lives, but I've still been trying to rest as much as a mother with mastitis should when needed. I am so thankful to God that each recurring time of this nursing issue, it hasn't resulted in full-blown mastitis or a fever. I share all of this as a short update, but also a little explanation to the reason I'm sharing this story. This weekend we went out as a family. For the past few weeks, Tim had been working 7 days a week in preparation for a big inspection. I had also been down with my nursing issues and had been unable to attend church service with him when he was off on Sundays this past couple of months. So I didn't want to push it this past Saturday when we went out together as a family since I wanted to be able to worship with our church the following day by not having a nursing issue reappear again -- the hardening sort of sits there and flares up when I've done too much. We were on our way home Saturday afternoon when I asked Tim if I could drop in for a short bit at Art Creations. He was so sweet to agree that it would be fine to stop by even if we were a bit hungry and had already been busy that morning and afternoon going to yard sales, a library book sale, and the grocery store. We arrived in the parking lot and it seemed very evident that the sale at the art store gathered more people than I thought it would that late in the day (just an hour before they closed). There was even a food truck and some tents outside! When I went inside by myself, I noticed various rooms of people attending art classes, and the hallways were lined with many vendors at different tables. There must have been 80-100 people there! It turns out that they were having an art expo -- I had somehow missed that detail in the email that they sent! I went to a paint section so I could look at certain colors -- especially gold. That's when a store clerk asked if I needed help and would like to talk to a representative of the paint I was looking at. There were many vendors there with samples of things I thought the children would love to try out or at least watch. So I called Tim to join me inside since I knew that I wanted to spend a bit more time in the store than originally planned. Tim came inside Art Creations with our children. 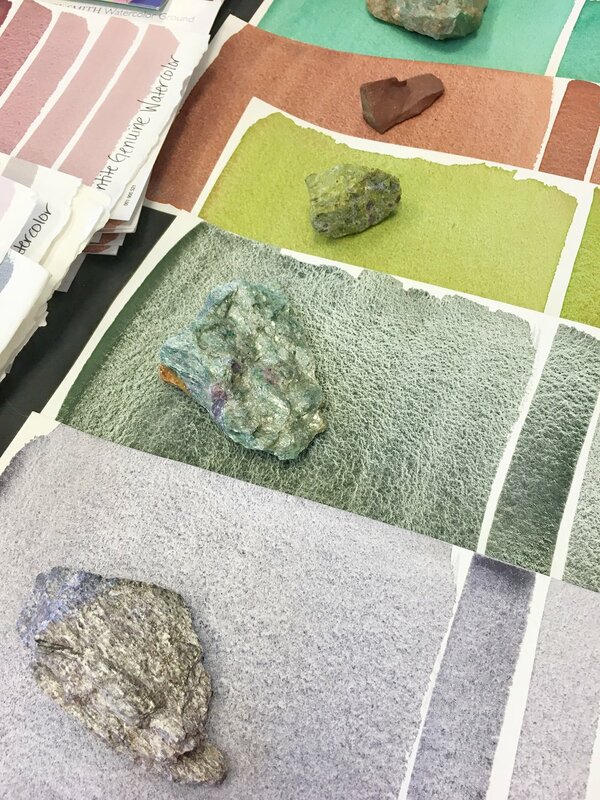 We watched an explanation of watercolor paints made by Daniel Smith which uses minerals and has a wonderful shimmery appearance in paintings! It looks like it has pearly mineral dust in it and is really pretty. I was also looking for certain pinks and was interested in learning about acrylic paints. I was able to talk to a lady from Golden Paints who let me try some Golden oil paint that felt so buttery to work with. She also gave me a free sample of iridescent gold paint in a small bottle made by Golden that is part of their high flow acrylics line. We walked to another table and were surprised when we were handed many samples of Ampersand art boards as well as other products which I can share about another time on our other site Wholesome Place. We had a great time talking to so many people at the store and hear what they had to share and teach us! We really needed to leave the store and eat. I also didn't want to push it any longer since I had to nurse again soon. Heistheway was wanting a new sketchbook for her drawings since she's been working on some books and products with me. The other children also wanted to have a sketchbook to use instead of printer paper. The store had many that were discounted down to around $4 and that was a great price for what we got! I really wanted to buy some tubes of paint to try out my idea for our projects, but wasn't sure if it would work out. I was concerned about the cost since paint can be so expensive. Even with the great sale, I would need at least four tubes of paint and new brushes which would cost up to $100. I have some watercolor brushes for my charcoal, but not for acrylics. The store clerk rang up my purchase for the three drawing and sketchbooks that Tim recommended we get for the children. Then she told me that we should join their raffle before we left. I asked, "One ticket per household?" She said no and encouraged me to enter us for all who were attending the expo! Tim and most of our children continued playing and walking outside enjoying the fresh air while I filled in the raffle ticket information with Abraham and Heistheway. I didn't take a good look at all the prizes on the table since there were so many, but I saw that there was a large basket with a bow wrapped in clear cellophane with numerous art supplies in it. I didn't take a good look at the basket to see what was inside and told myself, "I'll be so happy to win anything here on this table, even this little pen or marker set. Lord, I pray that, if You will be glorified, we would win anything here." I then thought how awesome of an answered prayer it would be if we won the grand prize. But I shook that thought from my head so I wouldn't covet those things in a bad way. Then the lady beside me filled out her ticket and said, "I’ve never won anything in my life!" I told her, "You never know!" and was hoping that she would win something. The store clerks told us that they were drawing the names that evening and that they would call us if we won. Saturday night passed, then Sunday, and Monday. By Tuesday, I had almost forgotten about the raffle. Though we had great excitement that day and were celebrating as a family with hugs and disbelief, I was also coming down with a lot of things physically. I didn't realize one of my water bottles had a tiny bit of mold in it, and I didn't see it while drinking. I think that the mold in my bottle was affecting my digestive system and giving me stomach pains, so we were glad to find that. I used to use a glass or stainless steel water bottle until it got too heavy. Even if my tummy hurt, I was still celebrating inside and so happy for our news (we can share more next week)! As the night got closer, I started coming down with the same nursing infection Monday night. I was in a lot of pain as my milk continued to fill up and wouldn't drain. My gallbladder even started acting up that evening too! So I had three areas of interesting pain and discomfort happening all at once, and I could hardly sleep. Sometimes, when I've been in pain and stuck in bed to heal, the Lord has used that time to help me accomplish or think through things I wouldn't have had the time to otherwise. But this time I wasn't seeing the blessing behind my pain: I was starting to question whether God was chastening me for something. I couldn't think of anything that I knowingly was in sin about, but I asked for God's forgiveness anyway for the things that came to mind like my struggles with worry (He tells us to be anxious for nothing) and some other things. As I laid in bed late Monday night, my pain almost drew me to tears. I've experienced worse, but it was starting to wear me out. Anyone in constant soreness or pain can attest to how draining that is on the body. Tim was awake for a short bit to help me, and I asked him in a whimper and sincerely, "Sweetie, is God punishing me?" He shook his head and said that he didn’t think so. I prayed and prayed that night, did some things to help my body heal and was so thankful my milk started to drain our baby nursed that night. Finally, most of my pain was gone, and I continued to pray for God's healing and encouragement. Tuesday morning, I woke up and forgot to take my phone off of its "do not disturb" mode like I usually do early in the morning after I wake, read the Bible, and pray so I missed a phone call. When I saw that I missed a call, I didn't recognize the number and their voicemail hadn't gone through yet. I called the number back and was surprised to hear it was from the Art Creations store! I was so happy and very much amazed! I even asked which name they chose since we had entered all nine of us into the raffle. She said that they had chosen mine! God had given me the things I wanted! We were now not only celebrating another surprise blessing this week, but also my other pains subsided, and I got the encouragement I prayed for! What amazed me when I saw the prize I had won is that an acrylic tube set, brushes, painting boards, and more was in the basket! God was so merciful to show me that He wasn't punishing me but rather working something out that will bring Him the most glory. I’m very thankful for that!